I will confess that summer is my least favorite season. I usually just do my best to ignore summer and go to the beach whenever I can to get away from the heat. But I have to admit I've been really enjoying some things so far this summer: the gardenias have been blooming - I brought a few indoors and they smell great. The flowers in the garden are blooming. The storms that roll in in the afternoon and sometimes cool things off. I have extra appreciation for the huge selection of delicious fresh fruits and veggies, from the blueberries we've picked at a local farm to the fresh corn, tomatoes, etc. we've been having. 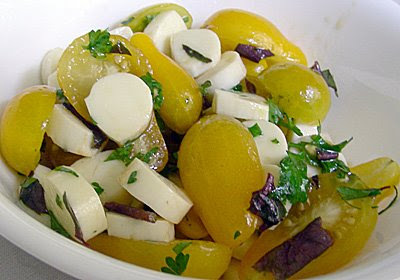 I found some yellow pear tomatoes at the farmer's market recently (our yellow pear tomato plant unfortunately died because of all the rain we got earlier in the season) and made a simple tossed salad with them, adding some mozzarella, a little fresh purple basil and parsley from the herb garden, a tiny bit of sea salt, and a little bit of good quality extra virgin olive oil and balsamic - it turned out so good!!!! So I may not be happy about the heat but at least there is lots of yummy food in the kitchen. That is a GORGEOUS salad! Congrats on winning the beautiful piece from Paper Napkin Poetry! I feel for you, dealing with the intense heat. You must live in the southern part of the USA! I am new to your blog! I like it! Thank you so much for the beautiful postcard LibbyQ and thank you Pom Pom for stopping by to visit!